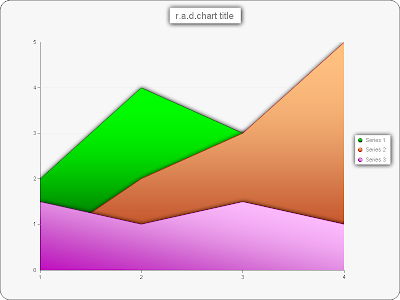 When Q4 SP1 was released, I remarked that one of the most interesting enhancements was the new shadow rendering engine that has been added to r.a.d.chart. The addition of a major enhancement like this is usually saved for a major release instead of being delivered in a service pack, but with V1 2007 still 3 months away I am happy get the enhancement now. Vladimir Milev sent me the above image to demonstrate some of the capabilities of the new shadow engine. You can see shadows applied to the series, chart title, and legend box with Gaussian blur effect. The shadows add nice depth to the chart (especially as applied to the overlapping series) and should be a welcome addition to all chart users. The chart online demos have not yet been updated to show off this functionality and the online documentation still makes no mention of the new Shadow Engine features. For now, you'll just have to download SP1 and try it for yourself to discover all that it can do. And with another major version of chart due in V1 2007, it looks like telerik's chart product is quickly starting to mature into a beautiful chart making component.